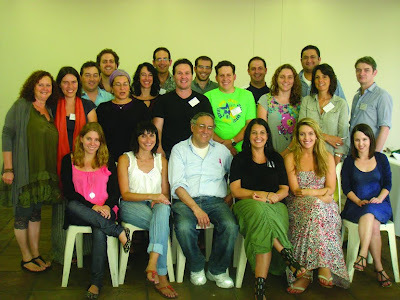 The Mini Nachum Goldman Fellowship group Cape Town 2011. “A Jewish community that does not offer some offense does not warrant a defence.” These were the powerful words of Dr Steve Bayme, the visiting scholar in residence for the third Mini Nahum Goldmann Fellowship that took place in Cape Town on 26 and 27 March. Following the success of the Mini Nahum Goldmann Fellowship (NGF) held in August last year, the latest effort gathered together some 30 young Jewish adults from all parts of the social, religious and political spectrum. They participated under the auspices of the NGF, a project of the New York-based Memorial Foundation for Jewish Culture. Its aim is to give a nonjudgemental and open space for young Jewish voices to be heard by each other and within their communities. Israel and the Diaspora The Mini Nahum Goldmann Fellowship tackled the theme of ‘Wrestling with Israel-Diaspora Relations’. It goes without saying that the subject matter was highly contentious and controversial. community, was a theme that caused much heated but respectful debate. Jewish institutional capacity was also closely examined, with respect to whether they do in fact represent the myriad of individual voices within theCape Town Jewish community. The subject of Jewish education was debated vigorously and there was general consensus that the more educated in matters Jewish and in Judaism, the more likely a person would be to have an affinity towards Israel and her future as a Jewish state. What makes the Mini NGF truly unique is that there are no hierarchical structures — every voice is given equal space and equal weighting, and every decision is made by the group from within and not imposed upon from without. It is a grassroots movement, in the true sense of the word. The idea that we own the future is something that reverberated strongly with all of the fellows. “Passionate disagreement only strengthens the Jewish community,” noted Dr Bayme in his closing remarks. It is not necessarily diverse opinion that shatters community cohesiveness, but apathy and failure to confront one’s own opinions and attitudes towards Jewish life, Israel and the role of Jews in the Diaspora.